The Audi R8's of Team ADT Champion Racing finished 2nd and 3rd today at Mosport International Raceway in round 8 of the American Le Mans Series. JJ Lehto and his No. 1 Audi R8 crossed the finish line 3.6 seconds behind the leader and the sister car driven by Frank Biela followed closely clinching 3rd place for the team. occur in our final two races." The second change occurred with the No. 1 Audi R8. The engine was misfiring intermittently and after this morning's warm up session, the team decided to switch out the engine and put a fresh engine in. Performed in a rapid 1:06 minutes, the engines were swapped and the R8 was ready to roll. Werner instantly proved just how well the engine was performing by immediately passing the No. 20 Dyson car on the first lap putting him into 2nd position. Pirro, who started in 4th position in the Audi R8 No. 2 car followed suit and also passed the No. 20 Dyson just a few moments later pushing him into third position. On lap 45, Werner and the lead Dyson car (No. 16) split around the sides of a Panoz GT2 car and Werner who found himself on line going into the corner was able to take the lead. Dyson dropped to 2nd and Pirro stayed in 3rd position. included a driver change. JJ Lehto replaced Werner in the No. 1 Audi and Frank Biela replaced Pirro in the No. 2 Audi. Both Audis retained their 1st and 3rd positions respectively. tires) and the R8 No.1 opted for fuel and only new tires on the front. The No. 16 Dyson car stayed out and gained back their original lead at this point. Lehto on his hard charge went off the circuit on lap 88 which resulted in a long slide in the grass. Lehto's Audi collected a lot of grass in the brake duct but the car remained stable. What looked like a potential win for Champion Racing turned around when the No. 16 Dyson, which took the lead during Champion Racing's final pit stops, came in for their final pit stop. Opting for fuel only (no tires), the No. 16 Dyson car came out of the pits again ahead of the two Audis. Their short pit stop combined with a few seconds lost when Lehto hit the turf resulted in Dyson Racing keeping their lead to the checkered flag. 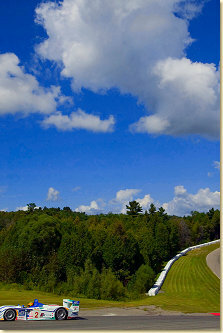 Petit Le Mans, Round 9 of the 2005 American Le Mans Series, is scheduled for 11 a.m. Oct. 1 from Road Atlanta. Live coverage will be available on SPEED Channel. American Le Mans Radio, and IMSA Live Timing and Scoring will be available at www.americanlemans.com. "This really didn't help us much in terms of the Championship. I really don't understand why we lost it today. We were ahead and then we were behind. I just don't understand and therefore I am not happy." "Most important was the fact that the car was running well after this morning and Friday's practice. Thanks to the team, they did a great job in changing the engine. It was a nice battle with James Weaver and when I saw my chance in traffic, I decided to take it. We battled but since I was on the inside, I won. This is a step from 3rd position from last week so hopefully we make another step to 1st position at Petit Le Mans." "This is more or less what we wanted to achieve this weekend. We all agreed a podium here was all we needed. Personally, I am not happy with the result, as the car was good. I had a lot of pick-up problems (marbles) and traffic was an issue and I decided to play it safe rather then risk the Championship." on the tires slowed me down some. So without a yellow, we were too far behind to capture the lead. From out standpoint we are happy as we gained some more Championship points."